by Tommy Goudge (September 6, 2013) – 98 drivers signed in to race on Woodstock Ford “Season Championship Night” at Ohsweken Speedway on Friday night. 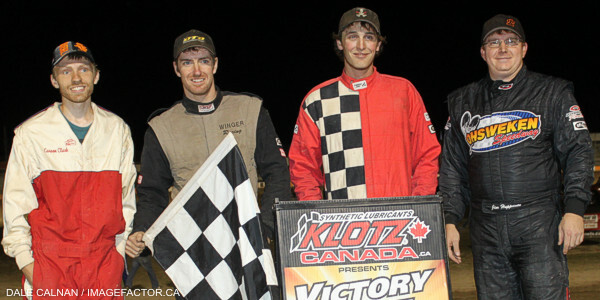 Wayne Johnson won the Corr/Pak Merchandising Sprint Car feature, Wyatt Van Wart took Affordable Towing & Recovery Thunder Stock honours, Davey Boughton won his 7th HRW Automotive Mini Stock feature of the season, and Tim DeBoer visited Klotz Canada Synthetic Lubricants Victory Lane after the Gale’s Auto Aftermarket Bomber feature. Dain Naida and Kyle Patrick made up the front row for the 25 lap Season Championship Sprint Car feature. Jim Huppunen entered the night 34 points ahead of Jamie Collard, and needing to finish 15th or better to secure his 2nd Corr/Pak Merchandising Sprint Car championship. His task became a bit more difficult when he was forced to qualify from the B-Main, but Collard had to do the same, so they started next to each other in row 9. Collard made up 9 spots and finished 8th, while Huppunen finished 11th and claimed the title. The race for the feature win was a compelling one, as Dain Naida led until lap 11, when Mitch Brown got by. Wayne Johnson was making his first Ohsweken appearance of the season in preparation for next weekend’s Canadian Sprint Car Nationals, and was up to 3rd from his 8th starting spot by that time. Johnson took 2nd from Naida on lap 14, and went to work chasing down Brown. He was not able to make much headway though, as Brown was running a fast line around the bottom groove. Johnson’s chance came when Brown encountered traffic, with many of those slower cars also running the low side of the track. Johnson ran down Brown and made the winning move on lap 22. Johnson cruised to his first feature win of the season, while Brown settled for the runner-up spot, followed by Naida, Kyle Patrick, and Shane Ross. Heat races for the 28 car field were claimed by Kyle Patrick, Wayne Johnson, and Tom Huppunen, while Jamie Collard won the B-Main, and Wayne Johnson won the Nathan Ackland State Farm Insurance “Top Gun” Award for accruing the most heat race passing points. Johnson’s time of 6:08.783 in the non-stop feature set a new 25 lap track record. Brett Rodwell and Shaun Quinn were on the front row for the 25 lap Thunder Stock, and Rodwell led the first 4 laps before Wyatt Van Wart got to the front after starting 12th. The championship race was also a focal point, as Lee Winger entered the feature 10 points ahead of Jim Lampman, 20 points ahead of Cory Turner, and 33 points ahead of Bryce Richardson. Lampman’s title hopes ended with an engine failure and brief fire just before the halfway point of the race. Winger was next to have trouble, as Richardson made contact with Winger’s rear bumper while the two raced hard for the 5th position, causing the championship leader to spin in turn 2. Winger was forced to restart from the back of the field, while Richardson was also sent back by officials for the contact. This left Cory Turner with a shot at the title, as he was running 3rd behind Van Wart, and Karl Sault. Winger and Richardson went to work when the race restarted, and were quickly back fighting for top 10 spots. Up front, Sault was able to challenge Van Wart for the lead, and led laps 18 and 19. Van Wart proved to be too strong though, and led the final 6 laps to take his 3rd feature win of the season, with Sault, Cory Turner, Ryan Beagle, and Dave Silverthorn, Jr. chasing him to the finish. Winger and Richardson crossed 9th and 10th, which was enough for Winger to win the championship over Turner by 8 points. Heat races for the 29 car field were claimed by Shaun Quinn, Wyatt Van Wart, and Lee Winger, while Robbie General won the B-Main. Mike Giberson and Jade Pelletier were on the front row for the final points-paying Mini Stock feature of 2013, but Laura Hughes took the early lead. Davey Boughton clinched the Mini Stock championship and Rookie of the Year award by starting the race, but wasn’t content to rest on his laurels, and moved up quickly from row 8 to 2nd behind Hughes before the 2nd lap was complete. Boughton got by Hughes and went on to dominate the rest of the non-stop 20 lap race, while Hughes and Alex Schuts put on a show racing for the runner-up spot. Schuts tried everything, but could not get by, with Hughes finishing 2nd, followed by Schuts, Jason Lungaro, and Chase Hess. Heat races for the 24 car field were claimed by Laura Hughes, Alex Schuts, and Jeremy May. Adam Hallett and Tim DeBoer made up the front row of the Bomber feature, with Tim needing to win and see brother Dusty finish 6th or worse in order to claim the season championship. Hallett led early, but Tim DeBoer got by and went on to take the feature win. Dusty DeBoer fought hard to move up from his row 4 starting spot, and eventually finished 5th to take his first Bomber title. Hallett came home 2nd, followed by Gillian Hils, and Brady Longboat. Heat races for the 17 car field were claimed by Adam Hallett and Brady Longboat, while Max Chechalk won the B-Main. The “Night Before the Nationals” presented by Burger Barn is ready to go on Friday, September 13. 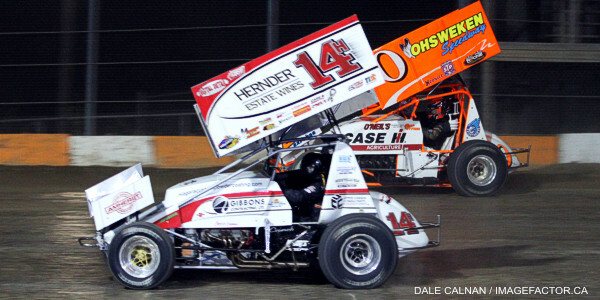 The first night of the 9th annual Canadian Sprint Car Nationals weekend will include Twin 15 lap features for the Sprint Cars, along with the TJSlideways.com Ohsweken Shootout, and the Dave McLeod Memorial “Mr. Sprint Car Challenge”, plus the HRW Automotive Mini Stocks racing in a special $500-to-win non-points event. Arrow Express presents the 9th annual Canadian Sprint Car Nationals on Saturday, September 14, with 70 or more 360 Sprint Car teams from all over North America expected to compete for the $12,000 feature winner’s cheque, plus the Affordable Towing & Recovery Thunder Stocks will be racing in a special $500-to-win non-points event. 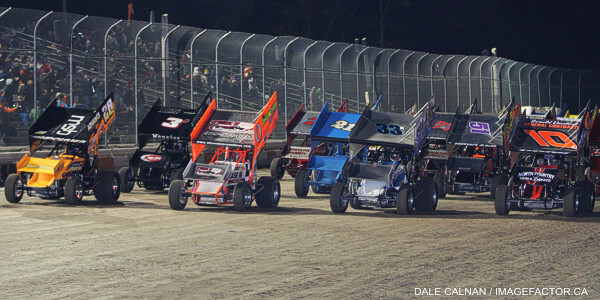 Advanced reserved seat tickets are now on sale for the 9th annual Canadian Sprint Car Nationals weekend on Friday, September 13, and Saturday, September 14. Please visit www.OhswekenSpeedway.com and check out our new system for online ticket sales, or purchase your tickets at the track on Friday, September 13 with your Visa, Mastercard, or debit card! 1. 33k Kyle Patrick (Tilbury), 2. 3r Shane Ross (Thedford), 3. 52x Scott Kreutter (Alden, NY), 4. 0 Glenn Styres (Ohsweken), 5. 9nz Havard Daniels (Coatesville, NZ), 6. 14h Jim Huppunen (Fenwick), 7. 7x Jamie Collard (Burford), 8. 71 Travis Cunningham (Grimsby), 9. 21j John Burbridge, Sr. (Simcoe), DNF. 11x Jeff Beamer (Welland). Time – 1:55.499. 1. 77x Wayne Johnson (Knoxville, IA), 2. 07x Dain Naida (Tecumseh, MI), 3. 80 Chris Steele (Vineland), 4. 5d Dave Dykstra (Port Colborne), 5. 10 Mitch Brown (Brantford), 6. 5 Keith Dempster (Alton), 7. 01 Mikey Kruchka (Hamilton), 8. 11 Jamie Turner (Caistor Centre), 9. 10j Jeremy Hughes (Burlington). Time – 1:50.432. 1. 27h Tom Huppunen (Fenwick), 2. 49 Todd Hoddick (Cheektowaga, NY), 3. 31 john Burbridge, Jr. (St. Williams), 4. 81 Derek Jonathan (Lewiston, NY), 5. 30g Steve Goldner (Aylmer), 6. 94z Stan Zanchin (Fort Erie), 7. 5c Conor Mahoney (Waterdown), 8. 15 Mike Ferrell (London), DNF. 6L Paul Lang (Port Colborne). Time – 1:53.818. 1. 7x Jamie Collard, 2. 14h Jim Huppunen, 3. 94 Stan Zanchin, 4. 5c Conor Mahoney, 5. 01 Mikey Kruchka, 6. 11 Jamie Turner, 7. 71 Travis Cunningham, 8. 21j John Burbridge, Sr., 9. 10j Jeremy Hughes, DNF. 6L Paul Lang, DNF. 15 Mike Ferrell, DNS. 11x Jeff Beamer. 1. 119 Shaun Quinn (Caledonia), 2. 77 Brett Rodwell (Caledonia), 3. 38 Terry Martin (Ohsweken), 4. 84rk Ryan Beagle (Vittoria), 5. 10 Jake Brown (Brantford), 6. 1 Chris Dickie (Brantford), 7. 00 Robbie General (Ohsweken), 8. 93 Melissa Miller (Ohsweken), 9. 17 Rob Disher (Grimsby), 10. 4 Brittany Gyokery (Jarvis). No Time. 1. 04 Wyatt Van Wart (Cambridge), 2. 55 Mike Thorne (Caledonia), 3. 44 Kevin Dawson (Caledonia), 4. 12 Brad Herron (Waterford), 5. 19 Cory Turner (Caistor Centre), 6. 23 Trevor DeBoer (Caledonia), 7. 777x Steve Hess (Ohsweken), 8. 31 Dave Bailey (Hagersville), 9. 68 Aaron Turkey (Ohsweken), 10. 911 Nick Liverance (Brantford). Time – 2:41.969. 1. 2 Lee Winger (Caledonia), 2. 81 Karl Sault (Dundas), 3. 33 Jack Myers (Wainfleet), 4. 9 Dave Silverthorn, Jr. (London), 5. 28 Jim Lampman (Caistor Centre), 6. 00x Derek Miller (Ohsweken), 7. 91 Ryan Turner (Caistor Centre), 8. 11r Bryce Richardson (Port Colborne), 9. 48 Mike Graham (Caledonia). Time – 2:41.801. 1. 10 Laura Hughes (Puslinch), 2. 1 Kathi Dickie (Brantford), 3. 66 Brandon Janssens (Woodstock), 4. 76 Jamie Goudge (London), 5. 84 Jade Pelletier (Wainfleet), 6. 11 Mike Giberson (Caledonia), DNF. 69 Rob Twitchett (Dundas), DNS. 90 Chad Smelser (Dunnville). 1. 81 Alex Schuts (Oakland), 2. 05 Dave Goodacre (Brantford), 3. 21 Jonathan Ayrton (Hamilton), 4. 22 Brittani Myers (Hamilton), 5. 79 Steve Miller (Paris), 6. 69e Dan Erskine (Caistor Centre), DNF. 29 Lucas Lubin (Hamilton), DNF. 7x Chase Hess (Ohsweken). 1. 16 Jeremy May (Hamilton), 2. 66r Cole Rodwell (Caledonia), 3. 7 Jason Lungaro (Hamilton), 4. 1c Evan Curtis (Wainfleet), 5. 18x Davey Boughton (Carlisle), 6. 96t Mike Taylor (Hamilton), 7. 12 Chantelle Hyatt (Millgrove), DNS. 43 Brian Watson (Hamilton). 1. 18 Adam Hallett (Cambridge), 2. 32 Gillian Hils (Dundas), 3. 188 Paul Longboat (Ohsweken), 4. 6 Wayde Thorne (Waterford), 5. 9 Tim DeBoer (Caledonia), 6. 43c Clinton Nicholls (Hamilton), 7. 97 Max Chechalk (Hamilton), 8. 28 Bob Burgess (Cayuga). 1. 66 Brady Longboat (Ohsweken), 2. 88 Jesse McDonald (Caledonia), 3. 42 Joe DeBoer (Hagersville), 4. 23 Dusty DeBoer (Hagersville), 5. 14 Gerald Burnham (), 6. 7L Valen Longboat (Ohsweken), 7. 05 Rebecca Corcoran (Milton), 8. 35 Justin Brown (). 1. 97 Max Chechalk, 2. 43c Clinton Nicholls, 3. 28 Bob Burgess, 4. 7L Valen Longboat, 5. 03d Dakota Potts, 6. 35 Justin Brown, 7. 05 Rebecca Corcoran. ADULTS/SENIORS/STUDENTS $15, KIDS 12 AND UNDER FREE! SPECTATOR GATES OPEN @ 5:00 P.M., RACING @ 7:30 P.M.